How to control high blood sugar, triglycerides, and cholesterol? This article discusses five herbal remedies for controlling insulin, cholesterol and triglyceride levels. Unhealthy lifestyle, junk food, processed sugars, trans-fat and additives, bad posture and limited to no physical activity all leads to insulin resistance and high blood sugar, triglycerides, and cholesterol. In this article we discuss five home remedies that can help you to regulate the blood sugar and reverse your tracks and reduce your triglycerides, and cholesterol levels. Several scientific studies confirm raw garlic, apple cider vinegar and cinnamon extracts reduces triglyceride, cholesterol, and blood sugar levels. In the end, we discussed the best recipe for lowering blood sugar, cholesterol and triglyceride levels. Glucose is the primary source of energy for our body’s cells. Glucose is transported from the liver to body cells via the bloodstream, and is made available for cell absorption via the hormone insulin. Insulin is a peptide hormone produced by beta cells in the pancreas. After you eat, the insulin levels go high as excess glucose is stored in the liver in the form of glycogen. Between meals insulin levels become low as the liver releases glycogen into the bloodstream in the form of sugar. This process keeps blood sugar levels within a narrow range. Blood sugar levels outside the normal range may be an indicator of a medical condition. The typical blood sugar levels are shown in the chart. When blood sugar reaches a certain level, the kidneys try to get rid of it through urine. Insulin regulates the metabolism of carbohydrates and fats. Insulin promotes the absorption of glucose from the blood to skeletal muscles and fat tissue. Insulin also regulates the functions of the body’s cells, including their growth. Insulin is critical for the body’s use of glucose as energy. Insulin resistance (IR) is a condition in which the body’s cells become resistant to the effects of insulin. In this cells fail to respond to the normal actions of the hormone insulin. The body produces insulin, but the cells in the body become resistant to insulin and are unable to use it as effectively, leading to hyperglycemia. With insulin resistance, the pancreas produces more and more insulin until the pancreas can no longer produce sufficient insulin for the body’s demands, then blood sugar rises. Insulin resistance is a risk factor for development of diabetes and heart disease. Insulin resistance commonly coexists with obesity. Triglycerides are a type of fat (lipid) found in your blood. When you eat, your body converts any calories it doesn’t need to use right away into triglycerides. The triglycerides are stored in your fat cells. Later, hormones release triglycerides for energy between meals. If you regularly eat more calories than you burn, particularly “easy” calories like carbohydrates and fats, you may have high triglycerides. You need some triglycerides for good health. But high triglycerides (above 200 mg/dl) might raise your risk of heart disease and may be a sign of metabolic syndrome. High triglycerides may contribute to hardening of the arteries or thickening of the artery walls (atherosclerosis) — which increases the risk of stroke, heart attack and heart disease. Cholesterol is a soft,waxy substance found in the lipids (fats) of your bloodstream and in all of your body’s cells. We need our cholesterol to stay healthy, but a high level of cholesterol is a major risk factor for serious health problems. There are several kinds of cholesterol in your body. However, cholesterol is categorized into two groups: high-density lipoproteins (HDL, popularly called the good cholesterol) and low-density lipoproteins (LDL, popularly called the bad cholesterol). Our body produces 75% of our blood cholesterol and rest we need through our food. High cholesterol blood levels can leave fatty deposits in your arteries and cause heart disease. For good health the total blood cholesterol level should be less than 200 mg/dL. 200-239 mg/dL is borderline-high cholesterol and more that 240 mg/dL is high cholesterol. Triglycerides and cholesterol are separate types of lipids that circulate in your blood. Triglycerides store unused calories and provide your body with energy, and cholesterol is used to build cells and certain hormones. Because triglycerides and cholesterol can’t dissolve in blood, they circulate throughout your body with the help of proteins that transport the lipids. 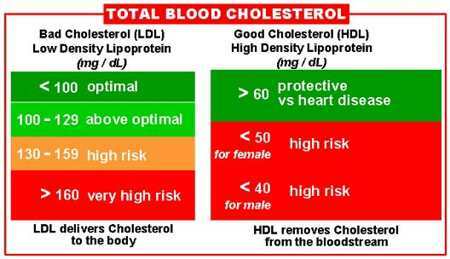 The chart below shows the normal level, borderline and high risk levels of triglycerides and cholesterol. Researchers observed that cinnamon extract has beneficial in Alzheimer’s disease by reducing β-amyloid oligomerization and cognitive decline and cinnamon further prevented glutamate-induced neuronal death in cultured cerebellar granule cells. The brain is the key organ to sense metabolic alterations and in turn controls food intake and glucose homeostasis, and there is considerable evidence that insulin is a key signal to act in the brain. Insulin in the brain was shown to inhibit glucose production in the liver and therefore lowered blood sugar levels, while this was absent in insulin resistant states like high fat diet (HFD). Cinnamon extracts were shown to have antidiabetic effects as a number of cell studies demonstrated an insulin-like action. 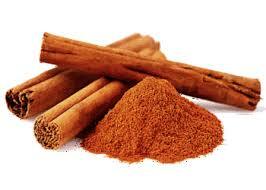 The treatment of diabetic subjects with cinnamon was investigated in several clinical trials. While a number of studies demonstrated an improvement in fasting blood glucose concentrations and insulin sensitivity . Taking of 1 to 4 grams of cinnamon daily helped people with Type 2 diabetes lower their triglycerides as well as LDL cholesterol. Garlic is one of the best remedies to reduce triglycerides. Garlic has been used safely since ancient times as both food and medicine. Combination of garlic with typical antidiabetic remedy has shown to improve glycemic control in addition to antihyperlipidemic activity. 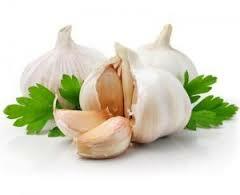 Garlic may be a good addition in the management of patients with diabetes and hyperlipidemia . Garlic has a unique property that that stops LDL cholesterol from oxidizing. It is oxidized LDL rather than raw LDL that poses a threat to your heart and circulatory system. Eat 1 to 2 raw garlic cloves on an empty stomach daily for a few months. A pple cider vinegar has been used therapeutically for thousands of years, and there are countless health benefits. A few animal studies have demonstrated a link between consumption of apple cider vinegar and lower triglycerides. Apple cider vinegar is used in salad dressings, marinades, food preservatives, and chutneys, among other things. It is made by crushing apples and squeezing out the liquid. Bacteria and Yeast are added to the liquid to start the alcoholic fermentation process, and the sugars are turned into alcohol. In a second fermentation process, the alcohol is converted into vinegar by acetic acid-forming bacteria (acetobacter). 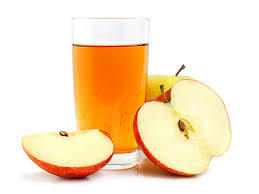 Taking one ounce (two tablespoons) of apple cider vinegar with meals has been shown to reduce glucose levels, improve insulin sensitivity, and significantly improve hemoglobin levels[1,2]. Do not take apple cider vinegar undiluted – the acidity can damage tooth enamel. Take one or two tablespoons of apple cider vinegar in a glass of water. No more than 1-2 tablespoons per day is recommended. Reduce the saturated fat in your diet. Eat less meat and fried snacks. Also try non-fat or low-fat dairy products. Reduce the cholesterol in your diet. Eat less eggs and red meat. Increase the fiber in your diet. Enjoy oats, barley, black beans, peas, fish, and many fruits and vegetables. Add omega-3 in your diet. Fatty fish such as salmon, herring, sardines, lake trout and albacore tuna are abundant in omega-3 fatty acids. Take cauliflower and kale in your diet. Exercise regularly. 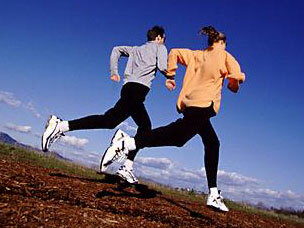 Aim for at least 30 minutes of physical activity on most or all days of the week. Regular yoga and exercise can lower triglycerides and boost “good” cholesterol. Take a brisk daily walk, swim laps or join an exercise group. If you don’t have time to exercise for 30 minutes, try squeezing it in 10 minutes at a time. Take a short yoga stretching, walk, or climb the stairs at work, or try some situps or pushups as you watch television. Best recipe for lowering blood sugar, cholesterol and triglyceride levels is: take 1 tbsp. organic apple cider vinegar + 1 raw garlic clove + 3 gm cinnamon powder + ½ tbsp. organic grated ginger; + 1 tbsp. raw honey. Put all these ingredients in a blender and blend them until they are well combined. Eat one teaspoon of this remedy before every meal. If it’s too strong to consume it on its own you can dilute it in a glass of water and then take it. Lowering your cholesterol and triglyceride levels will significantly reduce your risk of heart disease. Apple cider vinegar , garlic and cinnamon are very important for that. We examined the best recipe for lowering blood sugar, cholesterol and triglyceride levels. In addition, cutting out highly processed foods, while including more healthy sirtuin foods into your diet along with yoga and regular exercise, is also important. 1. Examination of the antiglycemic properties of vinegar in healthy adults. 4. Effect of garlic extract on blood glucose level and lipid profile in normal and alloxan diabetic rabbits. 5. Garlic (Allium sativum) supplementation with standard antidiabetic agent provides better diabetic control in type 2 diabetes patients. This entry was posted in Anti Aging, Articles, Health, Immunity Research, Meditation Research, Well-Being, Yoga and tagged apple cider vinegar, Blood Sugar, blood sugar chart, Cholesterol, cholesterol and triglyceride levels, cholesterol chart, cinnamon, garlic, Insulin resistance, recipe for lowering blood sugar, triglyceride chart, Triglycerides. Bookmark the permalink.